I have starting on decorating the house for Christmas….got some of the big things done so I only have to put bulbs on tree and other small things…I had “little man” overnight last Fri/Sat…he helped my find all the Christmas treasures…you can sure tell he is a boy!!! 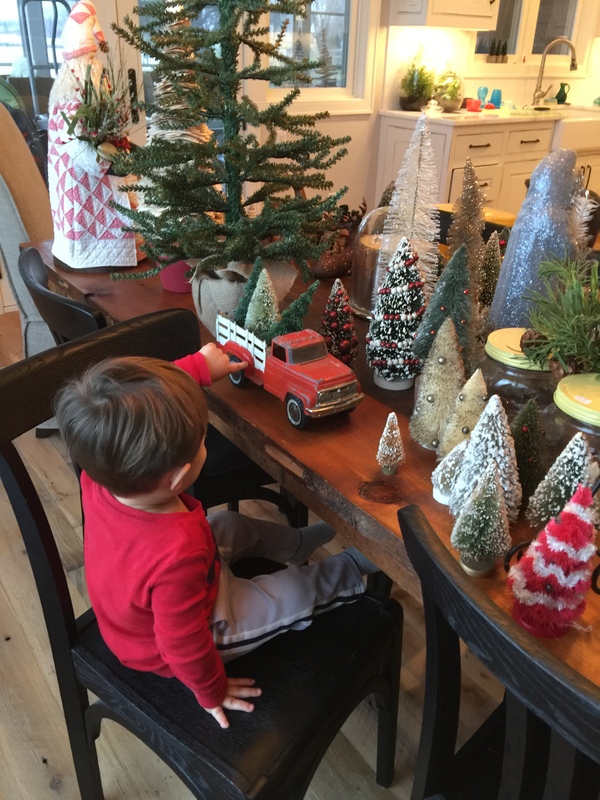 He wanted only to play with MiMi’s truck…So when its all done I’ll share some christmas photos…How is your progress on Christmas going? wishing you a speedy and good recovery. Take care. And Merry Christmas. Girly surgery was the best thing that ever happened to me! I hope it is for you as well once you are fully recovered! Thank you for everything that you do! I am so in love with my blocks! And so very excited to see what the settings are going to be! Done all I can do and been done since mid Nov because of surgery I had on my foot. Not as much as usual; but enough to be content. Looking forward to seeing all of your decorations! So glad all went well! Behave yourself!!! I hope you have a speedy recovery and I’m really looking forward to seeing the finish. Merry Christmas! I’m nowhere near because I had surgery and my husband had a knee replaced all within a week. Hope everybody has a Merry Christmas and Happy New Year.. I hope your feeling better Lisa. Can’t wait to get my blocks caught up and see the settings . I won’t have mine done this year but look out next year. Done except to hang stockings. Hope your recovery is quick. Merry Christmas to you and yours. Glad you are home and recovering. Your bottle brush trees are awesome. I collect them from everywhere I go! Hey Miss Kitty…Merry Christmas to you too!!! Tell the girls I said HI! Hi Lisa, so glad to hear you are home and that surgery went well. Your Grandson is adorable, and I can’t wait to see your Christmas pics when you’re done decorating, You’re way ahead of me, I was having too much fun at your store and Retreat house with the girls. Though I did get a couple special decorations from your store (a lamb and reindeer). Now I have to get the lights up quick so we’re not the last house in the neighborhood!! Thank you for the gift of “The magic of Christmas” blocks. I have really enjoyed the journey, and I kept up through #21. I will complete the other four blocks after the Christmas holiday. I would also like to thank you for the fabulous Beef Barley soup recipe. WOW! I have made it twice, and it was a smash with my whole family. I send well wishes and prayers for a smppth recovery. P. S. I don’t use social media, so I have attached a photo of my blocks here…. some are better than others…gotta love the triangle paper..
Glad you are feeling a bit more chipper, and good thing you love to handsew! You can enjoy your craft as you recover. QUESTION: is there a pattern for your Quilty Santa at the end of the table? Please say yes and provide info!!! Also, 12 days of Christmas…praying Juki is going to make the list! I think Santa is considering sending one down my chimney this year! Oh Happy Day! Please get lots of rest. Glad to hear all went well. I pray you continue to have a complete and speedy recovery. I also was wondering about the Santa, if there was a pattern or kit. Hope you recover quickly. Can’t wait to see how all the blocks will look together. I finished block 24 after your fix and it is insane with all the tiny triangles. Turned out great. Lisa! Take good care of yourself. You’ve had surgery, Girlfriend! Lay low and enjoy a little down time. I’m sure down time for you does not happen often. Wish I could bring you some homemade chicken soup! Who knows if it would do any good–but it’s about the only thing I cook that always turns out delish! Be well, and truly, thank you from the bottom of my heart for the MOC quilt. I have learned so much from your designs, your knowledge, and your enthusiasm for creative endeavors. Hugs & more hugs from me to you and your family. Woo Hoo! Now recover and be a good patient! Hugs out to you … take it easy. Wishing you a speedy recovery. Take good care of yourself. I love seeing pics of the little man. Glad all went well. It would be great if you could rest up all warm and cozy for even a week (or the full 6 weeks). Take care of yourself and listen to what the Doctor tells you to do. Little man is precious. HI Lisa… Be sure to get your rest! Also, I’d like to email you about something, May I get an email for you or the shop please. Glad to hear all is ok & you are well. I received block 24 & 25 (actually 22,23,24 & 25) last Thursday & a correction copy of 24 on Friday. Then today you have again sent block no. 24, I am a bit confused or am I missing something? Feel better! And here’s hoping you are feeling like yourself soon. Just don’t do too much. Sorry to hear that you had to have surgery Lisa. It is good that you are doing well and have time at home to recuperate. Enjoy every minute of it, especially time with little man. I did the first 13 Christmas blocks and have printed the rest, had to stop for a while to get some Christmas projects done but will pick it up again soon. Thank you always for your wonderful designs, can’t wait to see your finishing ideas. Wow, love your quilted santa in red and white, and who could resist that truck. Hope you feel better soon. Have a wonderful Christmas. Hi Lisa, hope your recovery is going well. I am wondering what triangle papers were used in the MOC blocks, I have them all printed out, but am waiting until the New Year to start. Thanks and have a very Merry Christmas and Happy New Year with your family. Thanks so much for responding. Can’t wait to see the final settings. I’m going to use the papers you suggest as I believe that will help me be more accurate and hopefully go faster. Glad to hear you are on the mend. Give yourself some time to heal and rest. Wishing you and your family all the best for this holiday season. Thank you Lisa. Can’t wait to get started. Question for you-could I enlarge the patterns to make 12″ blocks instead of 6″? Rest and heal as will take longer if don’t take care of yourself!